So it’s official, Apple is now the proud owner of Beats, the premium headphone and music streaming specialist, which leaves the company with an interesting challenge – how to integrate this high-profile consumer brand into their own very high profile portfolio. Apple is no stranger to mergers and acquisitions, having made more than 50 major acquisitions over the years, but they’ve all been technology companies with little or no consumer profile. Beats is another animal altogether. Apple have indicated that they will continue selling Beats products under the Beats brand, but what are the long-term brand architecture options? Often when a bigger brand takes another big brand over, it keeps the new affiliation under the radar. For example, if you go to Skype’s website and look for the Microsoft brand name, it is there, but you have to actively scroll to find it. It features at the very bottom of the page, along with reference to some of Microsoft’s other products, but if you never go below the fold on the website, you wouldn’t be any the wiser. With Microsoft, you could argue that the company’s image in the tech community would alienate those with a natural affinity to the challenger status of a company like Sykpe and impact user numbers. 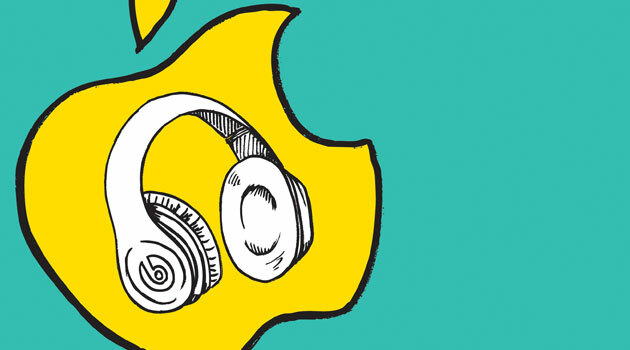 For Apple, taking a similar approach with Beats could also make sense. Until now, Beats has been neutral, not choosing to align itself to one side or the other of the tech divide. As a newly established member of the Apple Empire however, android fans or those who have taken an active dislike to anything and everything Apple, may choose to boycott the Beats brand too. One of the most famous technology campaigns of all time is Intel’s “Intel Inside” proposition, which pioneered the ingredient branding movement. With Beats, Apple could choose to take a similar approach, to both their headphones and music streaming business. Interestingly when Yahoo acquired Flickr back in 2005, the affiliation between the two brands only became obvious when you were invited to “login with Yahoo.” Fast-forward to today and not only do you have to set up an Yahoo account now to ensure continued access to Flickr but the Yahoo tool bar is also a permanent feature at the top of the site, reinforcing the link yet further. This also goes to show that brand architecture can be flexible to reflect the business strategy over time, in this case moving from a subtle association to a more obvious endorsement.